V.A. Yastrebov, "Numerical Methods in Contact Mechanics", WILEY-ISTE (2013). V.A. Yastrebov, G. Cailletaud, F. Feyel. "A local contact detection technique for very large contact and self-contact problems: sequential and parallel implementations". V.A. Yastrebov, J. Durand, H. Proudhon, G. Cailletaud. "Rough surface contact analysis by means of the Finite Element Method and of a new reduced model". D.S. Kammer, V.A. Yastrebov, P. Spijker, J.F. Molinari. "On the propagation of slip fronts at frictional interfaces". V.A. Yastrebov, G. Anciaux, J.F. Molinari. "Contact between representative rough surfaces". P. A. Sabnis, S. Forest, N. K. Arakere, V.A. Yastrebov. "Crystal plasticity analysis of cylindrical indentation on a Ni-base single crystal superalloy". A.M. Aragon, V.A. Yastrebov, J.F. Molinari. "A constrained-optimization methodology for the detection phase in contact mechanics simulations". D.S. Kammer, V.A. Yastrebov, G. Anciaux, J.F. Molinari. "The existence of a critical length scale in regularised friction". V.A. Yastrebov, M. Fischlschweiger, G. Cailletaud, T. Antretter. "The role of phase interface energy in martensitic transformations: a lattice Monte-Carlo simulation". "The contact of elastic regular wavy surfaces revisited". "From infinitesimal to full contact between rough surfaces: evolution of the contact area". V.A. Yastrebov, G. Cailletaud, H. Proudhon, F.S. Mballa Mballa, S. Noël, Ph. Testé, F. Houzé. "Three-level multi-scale modeling of electrical contacts: sensitivity study and experimental validation". "Sliding without slipping under Coulomb friction: opening waves and inversion of frictional force". "The Second Sandia Fracture Challenge: Predictions of Ductile Failure under Quasi-Static and Moderate-Rate Dynamic Loading". "A micromechanical constitutive modeling of WC hardmetals using finite-element and uniform field models". "On the accurate computation of the true contact area in mechanical contact of random rough surfaces". "Wear of cemented tungsten carbide percussive drill-bit inserts: laboratory and field study". "The role of the roughness spectral breadth in elastic contact of rough surfaces". D. Tkalich, V.A. Yastrebov, G. Cailletaud, A. Kane. "Multiscale Modeling of Cemented Tungsten Carbide in Hard Rock Drilling". A.I. Vakis, V.A. Yastrebov, J. Scheibert, L. Nicola, D. Dini, C. Minfray, A. Almqvist, M. Paggi, S. Lee, G. Limbert ... M. Mueser, M. Ciavarella. "Modeling and simulation in tribology across scales: An overview". "Fluid flow across a wavy channel brought in contact". "Trapped fluid in contact interface". A. Sergeant, V.A. Yastrebov, A. Mangeney, O. Castelnau, J.P. Montagner, E. Stutzmann. "Numerical modeling of iceberg capsize responsible for glacial earthquakes". "The Elastic Contact of Rough Spheres Investigated Using a Deterministic Multi-Asperity Model". A. Sergeant, A. Mangeney, V.A. Yastrebov, F. Walter, J.-P. Montagner, O. Castelnau, E. Stutzmann, P. Bonnet, V.J.L. Ralaiarisoa, S. Bevan, A. Luckman. "Monitoring Greenland ice-sheet buoyancy-driven calving discharge using glacial earthquakes". accepted for publication in Annals of Glaciology (2019). B.R. Akula, J. Vignollet, V.A. Yastrebov. "Stabilized MorteX method for mesh tying along embedded interfaces". "MorteX method for contact along real and embedded surfaces: coupling X-FEM with the Mortar method". "Wave-filtering properties of elastically-asymmetric architected materials". Extended mortar method for contact and mesh-tying applications [pdf] available soon. PhD thesis by Basava Raju Akula defended on the 4th of February 2019 at Ecole des Mines de Paris, Paris, France. PhD committee: M.C. Baietto, A. Popp, F. Lebon, N. Moës, V. Chiaruttini, G. Cailletaud, J. Vignollet, V.A. Yastrebov. Coupling mechanical frictional contact with interfacial fluid flow at small and large scales [pdf] available soon. PhD thesis by Andrei G. Shvarts defended on the 20th of March 2019 at Ecole des Mines de Paris, Paris, France. PhD committee: D. Lasseux, M. Paggi, S. Stupkiewicz, J.A. Greenwood, V. Rey, N. Moulin, G. Cailletaud, J. Vignollet, V.A. Yastrebov. D. S. Kammer, V. A. Yastrebov, J.-F. Molinari "Numerical aspects of rate-and-state friction laws" in book of abstracts of the 2nd International Conference on Computational Contact Mechanics Hannover, Germany, 15-17 June (2011). V. A. Yastrebov, G. Anciaux, J.-F. Molinari "Contact between rough surfaces: a rigorous finite element analysis" in book of abstracts of EuroMech: New Trends in Contact Mechanics, pp. 117-118 Cargèse-Corsica, France, 26-31 March (2012). V. A. Yastrebov, G. Anciaux, J.-F. Molinari "Analyse statistique du contact entre des surfaces rugueuses" in book of abstracts of the 24e Journées Internationales Francophones de Tribologie, pp. 20-21 Aix-en-Provence, France, 9-11 May (2012). D. S. Kammer, V. A. Yastrebov, J.-F. Molinari "Simulation et analyse de la dynamique de glissement entre deux corps viscoélastique en contact" in book of abstracts of the 24e Journées Internationales Francophones de Tribologie, pp. 55-56 Aix-en-Provence, France, 9-11 May (2012). M. Radiguet, D. S. Kammer, V. A. Yastrebov, J.-F. Molinari "Dynamics of Slip Fronts at Frictional Interfaces: Analysis of Slip Precursors and Rupture Velocity" in book of abstracts of the ECGS Workshop 2012: Earthquake Source Physics on Various Scales, pp. 102-103 Luxembourg, 3-5 October (2012). V. A. Yastrebov, G. Cailletaud, F. Feyel "Partial Dirichlet-Neumann method for unilateral frictional contact problems" in book of abstracts of the 3rd International Conference on Computational Contact Mechanics Lecce, Italy, 10-12 July (2013). A. M. Aragon, V. A. Yastrebov, J.-F. Molinari "A three-level detection framework for contact mechanics simulations" in book of abstracts of the 3rd International Conference on Computational Contact Mechanics Lecce, Italy, 10-12 July (2013). A.D. Kudawoo, V. A. Yastrebov, G. Cailletaud, F. Feyel "A global parallel detection and resolution strategy for large scale frictional contact problems" in book of abstracts of the 3rd International Conference on Computational Contact Mechanics Lecce, Italy, 10-12 July (2013). V. A. Yastrebov, G. Anciaux, G. Cailletaud, J.-F. Molinari "Elastic contact between representative rough surfaces" in book of abstracts of the 40th Leeds-Lyon Symposium on Tribology Lyon, France, 4-6 September (2013). M. Liu, H. Proudhon, V. A. Yastrebov "Finite Element Analysis of the Contact Behavior of Rough Surface" in book of abstracts of the 3rd International Conference on Material Modelling Warsaw, Poland, 8-11 September (2013). V. A. Yastrebov, G. Anciaux, and J.-F. Molinari "From infinitesimal to full contact between rough surfaces" in book of abstracts of the Contact Mechanics International Symposium (CMIS) Abu-Dhabi, United Arab Emirates, 3-5 February (2014). V. A. Yastrebov, D. S. Kammer, M. Radiguet, and J. F. Molinari "Dynamic fracture of adhesive vs frictional interfaces" In Proceedings of the 20th European Conference on Fracture Trondheim, Norway, 30 June-4 July (2014). D. Tkalich, G. Cailletaud, A. Kane, V.A. Yastrebov, and C. C. Li "Tool-rock interaction and drill bit buttons degradation in hard rock drilling" In Proceedings of the 20th European Conference on Fracture Trondheim, Norway, 30 June-4 July (2014). V. A. Yastrebov, G. Cailletaud, and F. Feyel "Contact enrichment technique for simulation of wear and complex interfaces" In Proceedings of the 11th World Congress on Computational Mechanics Barcelona, Spain, 20-25 July (2014). F.S. Mballa Mballa, V.A. Yastrebov, F. Houzé, G. Cailletaud, S. Noël, H. Proudhon, and P. Testé "Multiscale modeling of electrical contacts" In Proceedings of the Multi-physics modeling of solids Paris, France, 6-8 October (2014). A. Sergeant-Boy, A. Mangeney, E. Stutzmann, J.P. Montagner, L. Moretti, O. Castelnau, and V.A. Yastrebov "Source Inversion of Glacial Earthquakes" In Proceedings of the AGU fall meeting San Francisco, USA, 15-19 December (2014). V.A. Yastrebov, G. Anciaux, J.F. Molinari "Leakage through the contact interface between elastic solids with random rough surfaces" In book of abstracts IV International Conference on Computational Contact Mechanics Hannover, Germany, 27-29 May (2015). V.A. Yastrebov, G. Anciaux, J.F. Molinari "Elastic contact between representative rough surfaces" In book of abstracts 42nd Leeds-Lyon Symposium on Tribology Lyon, France, 6-9 September (2015). V.A. Yastrebov, S. Forest "Mechanical contact between rough elastic-plastic solids: scale effect in deformation of asperities" In book of abstracts 52th SES technical meeting Texas A&M, College Station, USA, 25-29 October (2015). A. Sergeant, V.A. Yastrebov, O. Castelnau, A. Mangeney, E. Stutzmann, J.P. Montagner, J. Burton "Numerical modeling of glacial earthquakes induced by iceberg capsize" In book of abstracts AGU fall meeting San-Francisco, USA, 14-18 December (2015). A. Sergeant, V.A. Yastrebov, O. Castelnau, A. Mangeney, E. Stutzmann, J.P. Montagner, J. Burton "Numerical modelling of iceberg calving force responsible for glacial earthquakes" In book of abstracts European Geosciences Union General Assembly 2016 Vienna, Austria, 17-22 April (2016). D. Tkalich, V.A. Yastrebov, G. Cailletaud, A. Kane "Multiscale mechanical modeling of cemented tungsten carbide in hard rock drilling" In book of abstracts 9th Annual US-France Symposia of the International Center for Applied Computational Mechanics (ICACM) Compiègne, France, 1-3 June (2016). B.R. Akula, V.A. Yastrebov, G. Cailletaud "Development of advanced numerical methods in contact mechanics for aerospace applications" In 1ère Journée des Doctorants Safran Tech Safran Tech, Magny-les-Hameaux, France, 23-24 June (2016). T. Sakimoto, J. Besson, Y. Madi, V.A. Yastrebov "Modeling of Slant Ductile Fracture in Drop Weight Tear Test (DWTT)" In book of abstracts 21st European Conference on Fracture 2016 Catania, 20-24 June (2016). A. Sergeant, V.A. 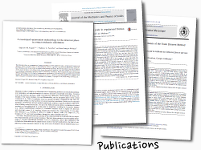 Yastrebov, O. Castelnau, A. Mangeney, E. Stutzmann, J.P. Montagner, J. Burton "Numerical modeling of iceberg calving and implications in seismic waves generated" In book of abstracts 31st IUGG Conference on Mathematical Geophysics Paris, France, 6-10 June (2016). A. Sergeant, V.A. Yastrebov, O. Castelnau, A. Mangeney, E. Stutzmann, J.P. Montagner, J. Burton "Numerical modelling of iceberg calving and implications in generated seimic waves" In book of abstracts 35rd General Assembly of the European Seismological Commission (GA ESC) Trieste, Italie, 4-10 September (2016). D. Tkalich, V.A. Yastrebov, G. Cailletaud, A. Kane "Multiscale thermo-mechanical modeling of cemented tungsten carbide in hard rock drilling" In book of abstracts 8th Multiscale Materials Modeling (MMM) Conference Dijon, France, 9-14 October (2016). A. Sergeant, A. Mangeney, V.A. Yastrebov, O. Castelnau, J.P. Montagner, E. Stutzmann "Investigation in the iceberg capsizing force responsible for glacial earthquakes and ice-volume discharge estimation from seismic records and a numerical modeling" In book of abstracts AGU Fall Meeting 2016 San Francisco, USA, 12-16 December (2018). B.R. Akula, V.A. Yastrebov, J. Vignollet, G. Cailletaud "Domain tying across virtual interfaces: coupling X-FEM with the Mortar method" In book of abstracts CSMA 2017: 13e colloque national en calcul des structures Giens, France, 15-19 May (2017). A.G. Shvarts, V.A. Yastrebov, G. Cailletaud "A strong fluid/structure coupling scheme for thin incompressible flow in the contact interface at the roughness scale" In book of abstracts CSMA 2017: 13e colloque national en calcul des structures Giens, France, 15-19 May (2017). A. Sergeant, A. Mangeney, V.A. Yastrebov, O. Castelnau, J.P. Montagner, E. Stutzmann "Investigation in the iceberg capsizing force responsible for glacial earthquakes and ice-volume discharge estimation from seismic records and a numerical modeling" In book of abstracts European Geosciences Union General Assembly 2017 Vienna, Austria, 23-28 April (2017). T. Sakimoto, J. Besson, Y. Madi, V. Yastrebov, S. Igi, R. Ikeda "Simulation Of Ductile To Brittle Transition From Slant Ductile Crack In Drop Weight Tear Tests" In book of abstracts 4th International Conference on Fracture Rhodes, Greece, June 18-23 (2017). D. Tkalich, V.A. Yastrebov, G. Cailletaud "A multiscale approach applied to constitutive modeling of WC hardmetals" In book of abstracts of the conference Advanced Problems in Mechanics Saint-Petersburg, Russia, June 22-27 (2017). A.G. Shvarts, V.A. Yastrebov "A strong coupling scheme for the thin fluid flow through the contact interface between wavy surfaces" In book of abstracts of the conference 5th International Conference on Computational Contact Mechanics Lecce, Italy, 5-7 July (2017). B.R. Akula, J. Vignollet, V.A. Yastrebov "Frictional Contact and Wear Along Virtual Interfaces: Coupling the Mortar Method with the X-FEM" In book of abstracts of the conference 5th International Conference on Computational Contact Mechanics Lecce, Italy, 5-7 July (2017). V.A. Yastrebov "Elastodynamic Sliding Of A Layer On A Flat Under Coulomb's Friction: Velocity Dependence, Opening Waves And Supersonic Slip Pulses" In book of abstracts of the conference 44th Leeds-Lyon Symposium on Tribology, Lyon, France, 4-6 September (2017). V.A. Yastrebov, G. Anciaux, J.F. Molinari "The Role Of Nayak's Parameter In Elastic Contact Of Rough Surfaces" In book of abstracts of the conference 44th Leeds-Lyon Symposium on Tribology, Lyon, France, 4-6 September (2017). A.G. Shvarts, V.A. Yastrebov "The Contact Between Rough Surfaces In Presence Of A Fluid Flow In The Interface: A Strong Coupling Scheme" In book of abstracts of the conference 44th Leeds-Lyon Symposium on Tribology, Lyon, France, 4-6 September (2017). F. Pérez-Ràfols, V.A. Yastrebov, A. Almqvist "Metal-to-metal Contact Between Rough Elasto-plastic Solids In Loading And Unloading With Application To Static Seals" In book of abstracts of the conference 44th Leeds-Lyon Symposium on Tribology, Lyon, France, 4-6 September (2017). B.R. Akula, J. Vignollet, V.A. Yastrebov "Contact along virtual interfaces: coupling the X-FEM with the mortar discretization" In the book of abstracts 7th GACM Colloquium on Computational Mechanics, Stuttgart, Germany, 11-13 October (2017). D. Tkalich, V.A. Yastrebov, A. Kane, G. Cailletaud "Multiscale Wear Modelling Of Cemented Tungsten Carbide Tools In Hard Rock Drilling" In book of abstracts of the conference Computational Modeling of Complex Materials Across the Scales, ECCOMAS Thematic Conference, Paris, France, 7-9 November (2017). P. Bonnet, A. Sergent, V.A. Yastrebov, A. Mangeney, O. Castelnau, J.-P. Montagner, E. Stuzmann "Mechanical Modelling of Iceberg Capsize Constrained by Seismic Inversion" In book of abstracts of the POLAR 2018, SCAR & IASC Conference, Davos, Switzerland, 15-26 June (2018). V.A. Yastrebov, G. Anciaux, J.F. Molinari "An Interplay of Nayak and Hurst Parameters in Mechanical Contact of Rough Surfaces" In book of abstracts of the Contact Mechanics International Symposium, Sanctuary of Oropa, Italy, 16-18 May (2018). B.R. Akula, J. Vignollet, V.A. Yastrebov "Frictional contact and wear along virtual interfaces" In book of abstracts of the Contact Mechanics International Symposium, Sanctuary of Oropa, Italy, 16-18 May (2018). A.G. Shvarts, J. Vignollet, V.A. Yastrebov "Trapped fluid in contact interface" In book of abstracts of the Contact Mechanics International Symposium, Sanctuary of Oropa, Italy, 16-18 May (2018). B.R. Akula, J. Vignollet, V.A. Yastrebov "Frictional contact and wear along virtual interfaces" In book of abstracts of the 6th European Conference on Computational Mechanics, Glasgow, United Kingdom, 11-15 June (2018). V.A. Yastrebov "Wave propagation through contact-based elastically asymmetric materials" In book of abstracts of the 10th European Solid Mechanics Conference, Bologna, Italy, 2-6 July (2018). A.G. Shvarts, V.A. Yastrebov "Monolithic approach to the coupling of the contact between rough surfaces with the interfacial fluid flow" In book of abstracts of the 10th European Solid Mechanics Conference, Bologna, Italy, 2-6 July (2018). B.R. Akula, J. Vignollet, V.A. Yastrebov "Contact along Virtual Interfaces for Wear Simulation: Coupling the X-FEM with the Mortar Discretization" In book of abstracts of the 13th World Congress in Computational Mechanics, New York, USA, 22-27 July (2018). P. Bonnet, A. Sergent, A. Mangeney, V.A. Yastrebov, O. Castelnau, P. Queutey, A. Leroyer, J.-P. Montagner, E. Stuzmann "Estimating the Volume of Capsizing Icebergs with Seismic Data" In book of abstracts of the AGU Fall Meeting, Washington D.C., USA, 10-14 Dec (2018). P. Bonnet, V.A. Yastrebov, A. Mangeney, O. Castelnau, P. Queutey, A. Leroyer, A. Sergent, E. Stuzmann, J.-P. Montagner "Estimating volumes of capsizing iceberg: mechanical modelling of capsize constrained by seismic signals" In Geophysical Research Abstracts, vol. 21, EGU2019-15329, EGU General Assembly 2019, Vienna, Austria, 7-12 April (2019). Contact Mechanics International Symposium (CMIS), Abu-Dhabi, United Arab Emirates, 3-5 February (2014), not present. 20th European Conference on Fracture, Trondheim, Norway, 30 June-4 July (2014), oral presentation. 11th World Congress on Computational Mechanics, Barcelona, Spain, 20-25 July (2014), oral presentation. 7th International Conference on Multiscale Materials Modeling, Berkeley, USA, 6-10 October (2014), not present. Predictive approach of sealing, Paris, France, 13 October (2014), invited talk. International Workshop on Dislocation Dynamics Simulations, Saclay, France, December 10-12 (2014), poster presentation. 18e Rencontre du Non-Linéaire, Paris, France, 17-19 March (2015), poster presentation. Contact mechanics and coupled problems in surface phenomena, Lucca, Italy, 30 March - 2 April (2015), oral presentation. IV International Conference on Computational Contact Mechanics, Hannover, Germany, 27-29 May (2015), oral presentation. 9th European Solid Mechanics Conference, Madrid, Spain, 6-10 July (2015), oral presentation. 42nd Leeds-Lyon Symposium on Tribology, Lyon, France, 7-9 September (2015), oral presentation. 52nd Annual Technical Meeting of the Society of Engineering Sciences (SES), Texas A&M University, USA, 26-28 October (2015), invited presentation. CMIS 2016: Contact Mechanics International Symposium, Warsaw, Poland, 11-13 May (2016), oral presentation. ICTAM 2016: 24th International Congress of Theoretical and Applied Mechanics, Montreal, Canada, 21-26 August (2016), invited presentation. Journées annuelles du GDR DYNOLIN (Dynamique Non Linéaire), ENSTA-ParisTech, Palaiseau, France, 10-11 August (2016), opening lecture. Micro/Nanoscale Models for Tribology, Lorentz Centre, Leiden, The Netherlands, 30 Jan - 3 Feb (2017), organizer. GDR MéPhy, Workshop on "Programmable Matter", ESPCI, Paris, France, 7 June (2017), oral presentation. 6th Biot Conferences on Poromechanics, Ecole des Ponts ParisTech and IFSTTAR, Paris, France, 9-13 July (2017), oral presentation. Leeds-Lyon Symposium on Tribology, Lyon, France, 4-6 September (2017), two oral presentations. 7th GACM Colloquium on Computational Mechanics, Stuttgart, Germany, 11-13 October (2017), invited presentation. Computational Modeling of Complex Materials Across the Scales, ECCOMAS Thematic Conference, Paris, France, 7-9 November (2017), oral presentation. 21e Rencontre du Non-Linéaire, Paris, France, 27-29 March (2018), poster presentation. Contact Mechanics International Symposium, Sanctuary of Oropa, Italy, 16-18 May (2018), oral presentation. 10th European Solid Mechanics Conference, Bologna, Italy, 2-6 July (2018), oral presentation. 13th World Congress in Computational Mechanics, New York, USA, 22-27 July (2018), oral presentation. CECAM Workshop "Modeling tribology: friction and fracture across scales", Lausanne, Switzerland, 28-30 January (2019), oral presentation and round table. VI International Conference on Computational Contact Mechanics, Hannover, Germany, 3-5 July (2019), keynote lecture.